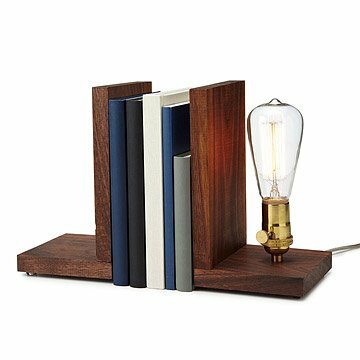 Featuring an Edison light bulb, these walnut bookends add a rustic touch to your home. Create a rustic display for your collection of hardcovers with this set of bookends, beautifully crafted in South Carolina from rich walnut wood. An industrial Edison light bulb adds an illuminating touch, casting a soft glow on your personal library. Working from their South Carolina Studio, Shelli Worley creates pieces that combine her passion for designing housewares and woodworking. She handcrafts and wires each piece, resulting in unique conversation pieces for your home. Handmade in South Carolina. Shelli Worley and her husband Seth live in Fort Mill, South Carolina, where they run their lighting shop. Throughout Shelli's life, creativity took her down quite a few avenues: music, drawing, sewing, painting, and woodworking. After she graduated high school, she decided to bypass college for the moment. She wanted to start something that she could nurture, learn from, and build into a legacy; She wanted work that was fulfilling. The concept for her pieces combined a passion for designing housewares (a skill that blossomed when she decorated her first home) and a talent for woodworking. I like that this product is made in US / Carolinas. Very good quality and cool design. My husband loves it.